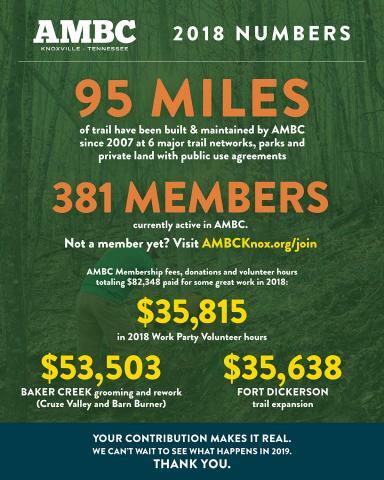 Ever wonder where your membership dollars and donations to AMBC go? Here’s a quick breakdown of or activity in 2018, and what we’ve done since our inception in 2007. 95 Miles of trail have been built & maintained by AMBC since 2007 at 6 major trail networks, parks and private land with public use agreements. We have 381 members currently active in AMBC. Not a member yet? Join us here. Time is money! 2018 Work Party Volunteer hours equaled $35,815 in donated time. $53,503 paid for grooming and rework on Cruze Valley Run and Barn Burner trails at Baker Creek Preserve. We’ve been working to expand and improve the trails at Fort Dickerson, and put over $35,000 into those efforts. Your contribution makes it real. We can’t wait to see what happens in 2019 and beyond. THANK YOU. Published on March 28, 2019 by ambcknox. Help us learn about mountain biking participation in Knoxville! The Appalachian Mountain Bike Club is dedicated to improving trails and trail access in our area. 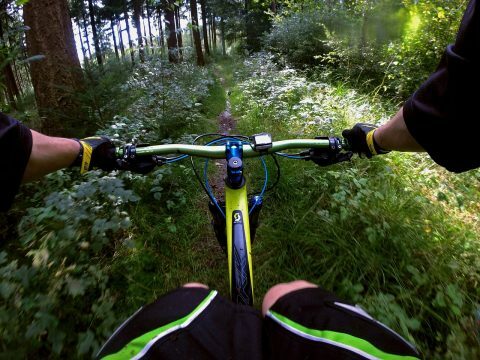 In order to better serve mountain bikers, we need your input. Please answer the following 11 questions about your mountain biking activities and interests in the Knoxville area. The survey should take less than 5 minutes of your time. Your responses are anonymous unless you choose to identify yourself at the end of the survey. Published on April 25, 2016 by ambcknox. The Wood Property trails are under construction and NOT open to AMBC members or the public. Please DO NOT ride there until the trail system is officially open. We hope to celebrate this great addition to the Urban Wilderness with the Legacy Parks Foundation in the Spring of 2016! This was a great event! There 60 people out for the event held at the Wood property beginner loop. We love to see such enthusiasm for mountain biking from the parents and kids. We can’t wait to get more involved in this event next year! Brad Spears shared the back story of the Oak Ridge trail project and the success of the recent work day. There were 53 people out to build the 1.3 mile “Sink Hole Trail” in the North Boundary area! This is significant in that it could open the door to over 22,000 acres of land owned by the Department of Energy in Oak Ridge. 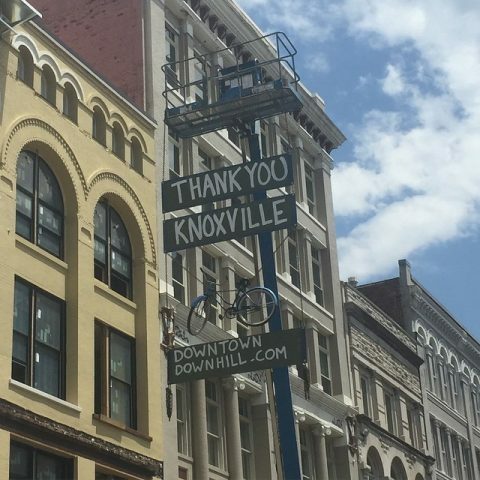 Great job on this to everyone who helped and thanks to the sponsors: RSI, UCOR, Knoxville Bicycle Company, and Yee Haw Brewing. Thanks to John Baker & Co. for another fantastic 12 Hour HOT Race! It never disappoints. And many thanks to all the awesome volunteers! What a fun day for our city! Were you there?! Want to do it again?? Write your local government representatives and tell them! This month’s Pint Night at Riversports Outfitters is benefitting the AMBC! Tomorrow night, 6-9 pm. The first 200 people get a custom pint glass filled with a delicious beer and one refill for a mere $5 donation to the club! Yakima is the sponsor and is sure to have cool stuff for raffle. Food truck too! Ride down and join us! Park and Ride! There is very limited parking onsite so PLEASE park at Anderson School and ride in. Spend the night! There will be onsite camping, which is fun and SAFE! Feel free to set up your campsite Friday night, or drive in Saturday and set up and then park offsite. Learn all the skills! There are clinics galore! Read about them here. We need a ton of volunteers to pull this off! Please let us know if you can help out for a very short shift. You’ll still get to ride and play! Eat breakfast! TVB will be cooking up a hot breakfast on Sunday morning and they promise an exciting culinary experience! November 21 – Mead’s Quarry – We’ll be working in Marie Myers and on trash cleanup on our adopted street Burnett Creek Road. Sponsored by Cycology Bicycles. December 12 – Sharps Ridge – Sponsored by TVB. Congress is considering three amendments to the transportation bill that would significantly reduce federal bike funding by cutting two critical programs, the Recreational Trails Program and the Transportation Alternatives Program. RTP directly impacts our quality of riding in Knoxville and is responsible for more than 10 Miles in our Urban Wilderness. The most recent project is the 6 miles that Legacy Parks is currently building at the Wood Property. Follow the People for Bikes initiatives and let our representatives know the importance of these programs. Click here for more information! We’ll see you at the next meeting on Monday, November 23! Published on November 03, 2015 by ambcknox. Published on September 29, 2015 by ambcknox. Thanks to the help of all our friends old and new, we won the nationwide race for the Bell Helmets Bell Built grant, by a truly overwhelming margin. This is a big deal not just for AMBC or Knoxville, but for the entire East Coast, especially the Southeast. Thanks to Exchequer Riders Club and COGGS for inspiring us to carry out the campaign that we did. They were strong competition and we look forward to seeing their projects come to fruition, too. We encourage you to check out their great trail systems anytime you’re in Mariposa, CA, or Duluth, MN. What’s next: We’ll be working with IMBA Trail Solutions to finalize the design of the trail, while also continuing work on the other trails in the new bike park with AMBC volunteers. Check back here and on AMBC’s Facebook page for an up-to-date work schedule and volunteer opportunities, and keep an eye on downtowndownhill.com for updates on the work-in-progress. Now let’s get to work. Let’s get rad. Published on June 06, 2015 by ambcknox.